One of the most challenging texts of Jesus recorded in the Scriptures is: Not MY will be done, but Yours be done! As our Stigmatine mode of imitating CHRIST. This is lived in the Stigmatine Charism by “Community, Corporate, Domestic Obedience – and presented as Apostolic, Missionary, Doctrinal Obedience”. The “End “that St. Gaspar Presents to us is to live as Apostolic Missionaries in the service, assistance of Bishops. The modality of this is achieved in St. Gaspar’s 2nd Constitution, entitled Modus: Under the Direction and with dependence on the Ordinaries of those places in which the [Community] Missions are carried out – this service must be offered in total Obedience to these bishops served in the exercise of this Apostolic task, after first receiving canonical faculties from them, and always observing the dispositions concerning the time and place of our Missions, always observing dependence toward them in carrying out the ministry. 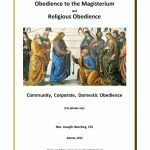 This is the sublime Mystery of Christ’s Personal Obedience to His Father – shared with the Baptized, mediated to us through St. Ignatius’ Letter on Holy Obedience, and applied by St. Gaspar to our Apostolic, Missionary and Doctrinal Obedience.